Obama injured, White House attacked, News story, Social Media – which one of them is true or accurate? 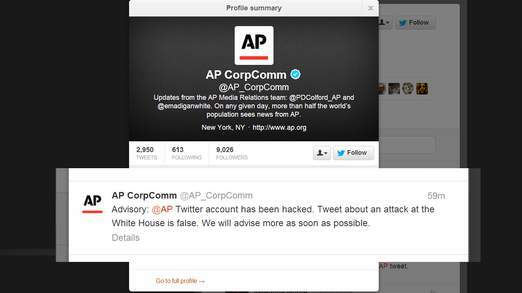 So Financial Regulators allowed for Social Media to be used in sharing and communicating with investors a few weeks back, and now AP get’s hacked! A paper reviewer on BBC World News this morning, wondered/speculated that maybe this hacker was to hijack the market and make a killing on the stock market – why this assumption or conspiracy theory? At the end of the day everything is done with the stock market based on results which have to be produced, checked and verified and the same with the news. It is rare that the major story are reported incorrectly – ok, there maybe part of a story that in-correct – and when news was reported via bulletins, we all believed it as it would have been checked prior to release. Now we have rolling 24 hour news, whilst the main news item is correct, some broadcasters do get caught up on/in the tide of hearsay or gossips from eye-witnesses or nowadays, reports from Social Media, which may not 100% accurate but at least the main body of the story is true. If we are to be part of a faster moving world all fueled by our self-reliance based on Social Media – how do we monitor and regulate it? Can we regulate within our company’s environment? Gossip, hearsay, a bad report, can have a massive effect on your business at least 10 times more than good news that you may want to report. How do we regulate this within our company as what are you regulating? – If you are hacked, was it because your password was not correct in security terms – well can anything? – Can we make all company news via just one channel? But does that mean we only tweet/update/report at certain times but it comes across as infrequent or impersonal? – Could we take out insurance against this? Yes we could, but whilst this may cover us and our clients – how do you cover, protect and value damage to your reputation this could cause? So, interaction is key through this article and the story behind it, but we need to decide on how we move forward. After all, we all are part this tide and we can make a difference, by thinking about what we do and working together to educate each other – or can we? People are too often too quick to jump on other’s and criticise them without working together and trying understand what that person was saying or trying to explain. So, before you open your mouth or place your fingers on the keyboard, make sure you see the wider picture not see it as a chance to self promote yourself or company! We can all use Social Media to create a better environment by working together, so let us be a community of one sharing information, support and help thus making our on-line community, one of not just trust but support and assistance to our on-line family. On LinkedIn this morning, James Day of Ingenious Britain provided an interesting article about Business Insurance and Employers Liability Insurance to which made me think about something I have often come across – why do I do things legally when others around me don’t! James – I think this is a much bigger issue than just employing people. How many companies do you actually work with, recommend and endorse that do not have business insurance at all? So many people operate in the world of business without insurance and yet provide businesses with advice and services. This really should be mandatory and any person or business employing the services of someone (or a company) should ask to see their insurance before engaging with them. Is it right that companies should operate without the necessary qualifications and insurance to offer advice, support, services and products without this? What happens if that business (or person) does something that can damage your both your reputation and company? What leg do you have to stand on? When I started in business I took advice from someone who I have known for a few years but we never spoke business just were good friends. I asked Dan McDonald about insurance and he thoroughly asked what I was doing and wanted to do. Only then after understanding what I did, he explained what I needed and as a result, without me asking, he speaks to me every 8 to 10 weeks to see what I am doing to make sure my insurance is right for myself, my business and more importantly my clients. As a result, last year, when I encountered some computer virus’s and lost a lot of data, on the next phone call, Dan immediately told me to not do anything until he came and saw me. Now, as a result if anything happens, I am fully covered via IPS protection against Data lost, damage, hacking or spamming due to holding client Data and this is something I would never of thought about, yet Dan wasn’t thinking of me, he was thinking about my clients and I needed to be protected to protect them. Note:- (By the way, before any one says anything, this blog is about me, my experiences and views and not endorsing or recommending either James Day or Dan McDonald but all I will say, is that I met and had dealings with both people and say to you, that it would worth you speaking to both these people as James can help you with advice about what is happening in the business world and Dan can help you with your insurance questions). Therefore, whether you think your current suppliers are doing a great job or not – check do they have the correct insurance? What happens if something goes wrong can you re-cover these costs from that person or company? So, with it nearly being lunchtime now, just think over lunch about this and then think of the people you are working with this afternoon and contemplate this, the work they are doing for you goes wrong, it causes major problems, are you covered or not? It is worth considering…….